There is a large collection of books on the Indian forces being sold by DNW in their next sale. The books are from the library of Peter Duckers. Singh is confirmed as having received the latter four clasps listed above and was promoted Ressaidar on 1 February 1908. He also held a Musketry Certificate and a Native Officers Certificate in Transport Duties. The following comes from the 2002 auction catalogue. "Queen’s South Africa 1899-1902, 2 clasps, Johannesburg, Diamond Hill (Jemadar Mahboob Singh, 6th Bngl. Cvlry.) suspension claw re-fixed and signs of repair to backstrap of top clasp, otherwise very fine. Mahbub Singh joined the 6th Bengal Cavalry on 3 September 1887. 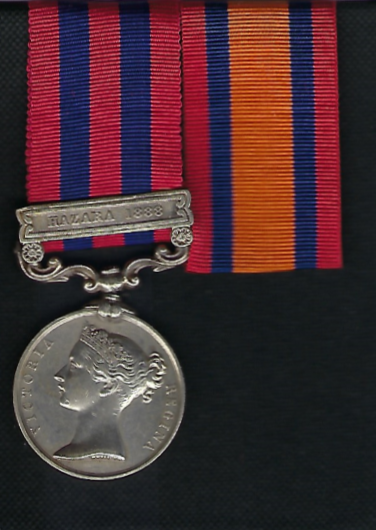 He served on the North West Frontier of India, 1897-98, including operations on the Samana and in the Kurram Valley during August and September 1897; and in Tirah in 1897-98 (Medal with three clasps). Promoted to Jemadar on 24 October 1900, Mahbub Singh served in South Africa, 1899-1901, including operations in Cape Colony, south of Orange River, 1899-1900; operations in the Orange Free State, February to May 1900, including operations at Paardeberg (17th to 26th February); operations in Orange River Colony (May to 29th November 1900); operations in the Transvaal between 30th November 1900 and 31st May 1902 (Queen’s medal with four clasps). Mahbub Singh was promoted to Ressaidar on 1 February 1908 and retired in about 1912. The Q.S.A. 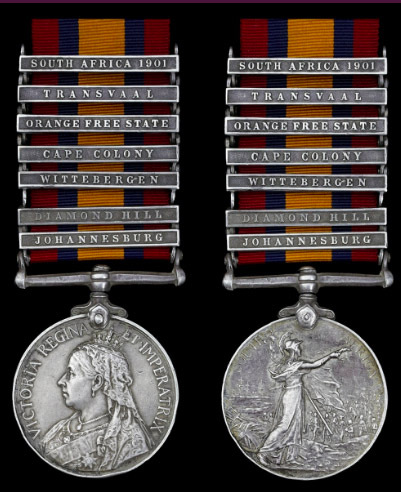 medal roll shows entitlement to 4 clasps, Cape Colony, Orange Free State, Transvaal, and South Africa 1901. Jemadar Mahboob Singh, the only native officer, and nine N.C.O.s and men of the 6th (Prince of Wales’) Bengal Cavalry received the Q.S.A. in silver. A further eight followers, all Syces, received the medal in bronze. Sold with a copy of the roll." The QSA to Mahboob Singh just sold for a hammer price of £700. A rather nice IGS'54 with the clasp Hazara 1888 arrived at the barrack guardhouse this morning named to "1016 Sowar Dost Muhammad Khan,15th Bl Cavy" . As you can imagine this is the medal's second tour of duty in the Cape, hopefully longer than the first six month's tour. Of particular interest are the remarks on the roll WO 100/296 pp 286 & 290. I have written elsewhere on the Bhistie Corps but in preparing a billet for Dost Mohammed Khan I uncovered some new information. Our water supply arrangements are quite inadequate for an army operating in a barren dry country, such as this; and, as you know, we have had to apply to India to send us bhisties and puckals for bullocks. 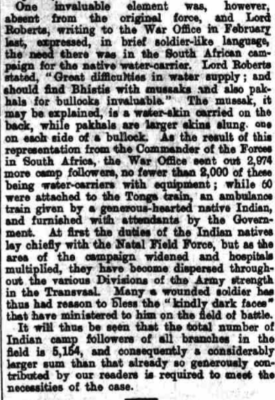 The Bhistie Corps embarked at Bombay on the Nankin on the 17th March 1900 (1052 strong) & on the Muttra on the 27th March (927 strong) & disembarked at East London on the 15th April (Muttra) for service in Cape Colony. It was commanded in South Africa by Capt. HC Ricketts, 15th Bengal Lancers, from March to August 1900. The Bhistie Corps was divided into two, No III & No. IV, but were later merged into one, the No.II Bhistie Corps. No.II Bhistie Corps was later commanded by the previous 2nd in command, Capt. CEEFK Macquod 1st Lancers, Hyderabad Contingent, from 19th June 1900 until demobilization in India. As to the work of the Bhistie Corps: - there is this snipet from Briggs: "Staff work of the Anglo-Boer War 1899-1901" which implies that 1000 odd bhisties were attached to Strathcona's Horse. This might imply that No I Bhistie Corps was commanded by Captain Chesnay. Under these circumstances the flagship and gunboats proceeded to Delagoa Bay, and the half of Strathcona's Horse which they had been escorting returned to Durban, and there entrained for Bond's Drift (on the Tugela), and marched to a place a few miles north of Eshowe, where orders awaited them to march back again to Durban. So, with their 700 pack mules and 1100 bhistis, in charge of Captain Chesney, 17th Bengal Lancers, they began the 130 miles march, which they accomplished in three days, a feat that has not been equaled, with pack transport, during this war, which is saying a good deal, when beaten " records " in marching have been of constant occurrence. 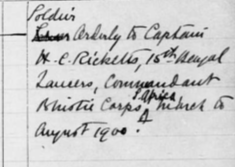 On July 1 Strathcona's Horse first came under fire at Greylingstadt, and from that time to the first week in August marching and fighting with General Clery's Division were the events that diversified the days. On the 7th of that month the chief part Strathcona's Horse had to play in this great drama was given to them when they were attached to the 3rd Mounted Brigade going north from Paardekop, with General Sir Redvers Buller, on perhaps the most difficult march of the campaign, though not the longest, which is an honour that belongs to the Winberg column. That is a fascinating piece of research. I can imagine you are very pleased with that IGS.